OXFORD, Miss. 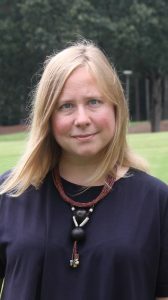 – The Mississippi Law Journal is putting together a special issue featuring several works focused on Mississippi legal history, including articles written by Antonia Eliason, a University of Mississippi law professor, U.S. District Judge Michael P. Mills and former Mississippi Supreme Court Justice James L. Robertson. “We are very excited to be publishing this special Mississippi-focused issue,” said James Kelly, the journal’s editor-in-chief. “The articles in the book tell the stories of people who have helped shape our state’s history and law. Eliason’s article, titled “Lillian McMurry and the Blues Contracts of Trumpet Records,” focuses on a Jackson-based record company established and run by Lillian McMurry from 1950 to 1955. McMurry was a pioneering businesswoman who discovered and signed some of the most prominent artists in the blues genre, including Sonny Boy Williamson and Elmore James. “Lillian McMurry has become a hero of mine; her picture hangs in my office to remind me of the strength of character and compassion that she demonstrated as the head of Trumpet Records,” Eliason said. “After spending so much time in the archives reading her correspondences with the artists that she signed, I feel like I’ve come to know her personally. Drawing on archival material, the article demonstrates a progressing level of sophistication for the young record label, as well as the ways in which McMurry’s business practices helped promote increased fairness and transparency in recording contracts. “At a time when there were so few female players in any capacity in the recording industry, she broke barriers while avoiding the rapacious practices of many record label executives,” Eliason said. “She also treated all of her artists the same, irrespective of race, even though she was operating the highly segregated milieu of 1950s Mississippi. The article “Dry September Revisited,” written by Mills, chronicles the stories of a group of Mississippi legislators who stood up against Walter Sillers, the powerful speaker of the Mississippi House of Representatives, after he invited Maj. Gen. Edwin Walker to address the Legislature. The legislators opposed Walker’s speech because of his role in working to block James Meredith’s entry into UM. Former Mississippi Supreme Court Justice James L. Robertson’s work, “Only People Were Slaves,” recounts the story of an early freedom-by-residence case brought by a group of slaves. The case, decided in 1818, is notable as the first known instance in which the court of last resort in a Southern slave state ruled that the slaves were free. The article features the first publication of several original archival sources and is adapted from a chapter in Robertson’s forthcoming book, “Heroes, Rascals and the Law: Constitutional Encounters in Mississippi,” which is being published by the University Press of Mississippi. The themed edition of the Mississippi Law Journal is slated for release in April.